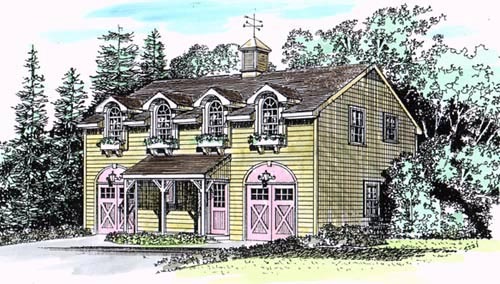 House Plan #5221 - Two story Colonial Carriage house residence with a two-car garage and a family room on the first floor. House Design # 5221 offers multiple possibilities: a vacation house, a retirement house or as a starter house built in the rear of the property and later rented for income after the mainhouse is built. The first floor has an entrance foyer with 1/2 bath and a large family room beyond which has access through sliding doors to the rear yard terrace. This area may also be used as a hobby room, exercise room or a studio. Access is also provided from this room to either garage. From the foyer a stair leads up to the second floor apartment which has three bedrooms, a full bathroom and a combination living/dining room with a full kitchen. The overall dimensions of the house are 41'-4" by 25'-4" and the height is 24'-0" from grade to the main ridge. Square footage for each floor is 1,046.88 for a total of 2,093.76. There is no cellar.